Tonight's going to be about the distance events at Raleigh Relays, but tomorrow is going to be all about the sprints at Dudley High School's Panther Invitational! There is pretty much a major matchup in all of the sprint/hurdle and sprint relays tomorrow between a lot of North Carolina's powerhouses! Southeast Raleigh, Hillside, Parkland, High Point Central and Rocky River will all be in attendance. We preview some of the best events below. Complete entries are listed at the bottom of the page. Sierra Fletcher (Southeast Raleigh) versus Nicole Barnes (T.W. Andrews) in the 100m Hurdles. These girls have run 14.65 and 14.64 respectively this outdoor season and were both indoor state championships in their respective classifications over the 55m Hurdles. Kiya Oviosun (Unattached) versus Kyna Robinson (Southeast Raleigh) in the 400m Dash. Oviosun emerged as a 400m star last spring running NC#4 All-Time 53.53 at the NCHSAA 4A Outdoor State Championship. 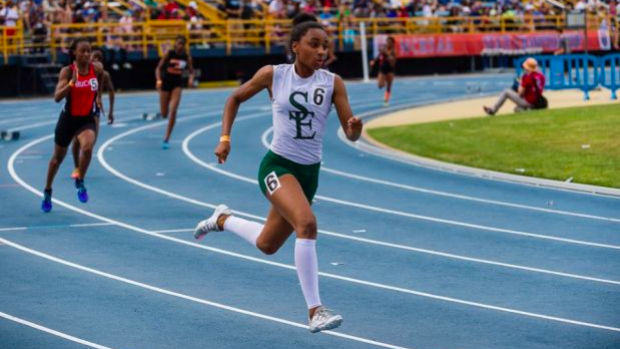 Robinson has been on the scene the last two years as a top 400m runner in NC, but the breakthrough for her has come after setting a North Carolina Indoor State Record in the 500m clocking 1:12.33. This leads me to believe she's going to be able to shatter her already impressive outdoor PR of 54.94 this season. Leah Bolden (High Point Central) was a star in the 55m dash this indoor season, and we'll see her outdoor debut under FAT timing tomorrow against a stacked field including Kamaya DeBose-Epps (Glenn) who ran 11.99 last spring, Kiya Oviosun, the 400m star who is very well rounded amongst all the sprint events, and all-around track star Nicole Barnes doubling in the 100m Dash and 100m Hurdles. The Girls 200 could be the best event of the day with a lot of the stars we mentioned above capping off their days in the 200m dash. Looking at this field it's hard to count any of the top 9 girls out of getting a win, and we're sure it's going to be a fast one. One of the best battles last spring was between Jessica Wright (Hillside) and Sierra Fletcher (Southeast Raleigh) in the 300m Hurdles. We'll see both square off head to head this weekend, unfortunately Hillside is no longer 4A so we won't see the rematch at the outdoor state championship this season. But these are two of the best (if not the best two) long hurdlers in North Carolina. On the boys side the first big event of the day will be Kamari Norman (Hillside) against Romell McRae (Southeast Raleigh), Joseph Littlejohn (Parkland), Jacquez Roseboro (Parkland) and Enoch Cheung (Raleigh Charter). Norman has emerged as a star sprinter getting an upset win in his first indoor track season in the 55m dash indoors. This will be the first big test in the 100m Dash for most of these boys. Parkland boys versus Southeast Raleigh boys in boys the 4x200 and 4x400 are going to be a show. These teams ran very similar times all throughout the indoor season, and it's always a battle when these two sprint powers clash. We could see a lot of boys go under 50 seconds in the 400 headlined by Anthony Morgan (Grimsley) and Savien Hayes (Parkland). Morgan holds a PR of 49.05, and after a strong indoor season in the 500m Dash I think he's certainly got a PR coming in the 400m. Hayes had a similar indoor breakthrough in the 300m finishing as the 4A runner up clocking 34.87. Kacey Pratt (Hillside) has run 49.62 and will be in contention as well as sophomore Brian Williams (Southeast Raleigh) who has run 50.12. Trevor Kirkland (Middle Creek) set a PR last week at Wake County running 1:58.83. He'll be in another highly contested 800 this week with Josh McLean (Millbrook) who ran 1:58.41 at regionals last year, Jakel Chalmers (Grimsley) who holds a PR of 1:59.42 and Kirkland's teammate Befiker Ollivierre who ran 1:59.64 last week.